This very detailed St. Nicholas religious pendant doubles as a locket (see detail photo under More Photos). This type of pendant typically stores a "filakto" or other type of religious talisman. 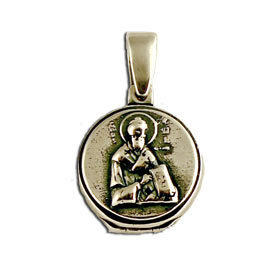 This pendant is made and imported from the island of Corfu where St. Spyridon is the patron saint and his relics are stored. In Greece, as well as other eastern European nations, Agios Nicholas is the patron saint of sailors (claimed to have been a sailor or fisherman himself), as well as the saint of merchants, archers, children, and students. He is often called upon by sailors who are in danger of drowning or being shipwrecked. He was a Lycian saint who had a reputation for secret gift-giving, but is now commonly identified with Santa Claus. When his parents died, Nicholas is said to have given his inheritance away to the poor. The impressive list of his good deeds and generosity seem to hint that he may have worked as a bishop, thus is is commonly portreyed wearing the insignia of this profession: a red bishop's cloak, a red miter (cap), and a bishop's staff. Not only was Nicholas intolerant of pagans, but he was also intolerant of Arianism. Nicholas is listed as a participant in the First Council of Nicaea. The destruction of several pagan temples is also attributed to him, among them the temple of Artemis. Today, the relics of St. Nicholas are kept in the Church in Bari.